With Noh no Ikebana, I often chose dishes such as kimchi and chirashi zushi (sushi with colorful toppings) as a theme for my arrangement, in addition to seasonal features and appreciation for agricultural products. In that case, I combine ingredients and tools I use for the dishes with flowers and other materials to give it a sense of seasons. The theme of this arrangement is “The first spring storm.” The container is a dead branch of Japanese apricot I found in my garden. 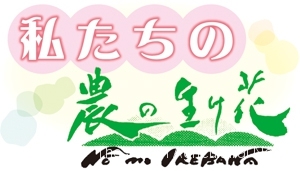 I added several types of local specialties, such as mushrooms, strawberries, and hassaku oranges. I used no flowers, no plants. However, I used the mushrooms instead of flowers, and strawberries and oranges to add colors. This way, I expressed the spring in my community. 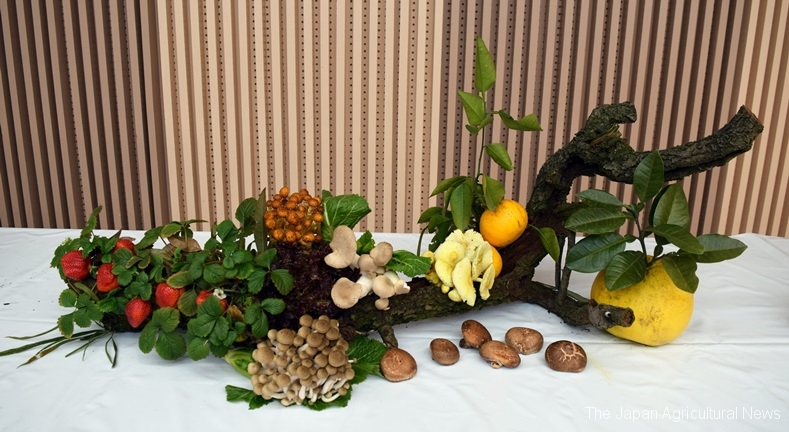 ＜Materials＞Eryngii, brown beech and shiitake mushrooms, strawberries, hassaku oranges, Citrus grandis, sanchu lettuce, etc.